Lush succulent greens and stark cement-gray, combine to give this artificial plant arrangement and clay planter a sharp, yet welcoming look, perfect for bringing stylish warmth to modern decors. The small 4-inch-square footprint is ideal for accenting limited desk or counter spaces, while the varied succulent shapes and hues give the arrangement depth to make it an eye-catching decorative addition. Needing no watering or other maintenance, these faux plants are perfect for the busy home or office, where they can enjoyed for years without upkeep. SPECS: Overall- 8.7 H X 4.3 W X 4.3 D; Pot only - 3.9 H X 4.3 W X 4.3 D; Opening 3.8 W (in inches). 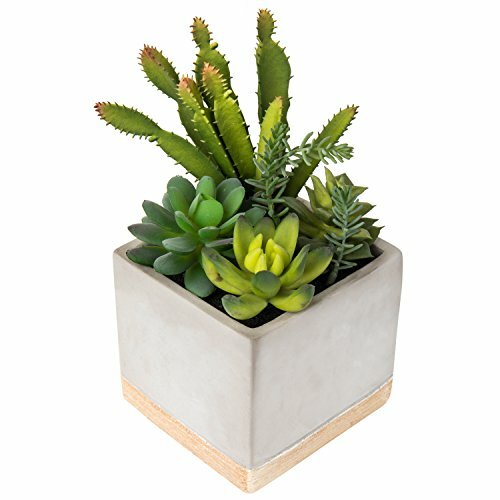 DESKTOP SUCCULENT ASSORTMENT: 9-inch tall faux plant arrangement in cement-tone planter with painted faux-wood base. MODERN INDUSTRIAL DECOR:A simple cube-shaped planter, with cement-like color and texture, creates a stylish industrial look, perfect for home or office decor. COMPACT ACCENT: 4-inch-square footprint is ideal for decorating desks, shelves, counters, and other small spaces. NO WATERING REQUIRED: Artificial plants need no maintenance or sunlight, and can provide years of enjoyment, without the upkeep.